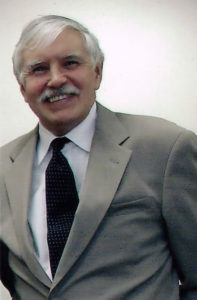 Agustin (Tim) Maldonado FARA; NCARB graduated from the Cooper Union School of Architecture in 1966, and received a M.S. in Tropical Architecture from Pratt Institute in 1968. He earned an Advanced Hospital Planning Certificate from Columbia University and the New York Chapter of the American Institute of Architects in 1973. Tim is married to Elaine Maldonado who is a 1968 graduate of The Cooper Union School of Art. Tim Maldonado has an active private architectural practice covering a wide range of residential and commercial projects, as well as master planning and feasibility studies. His works include the master plan for Vikings Marina, the Headquarters for American Gold Chain, the New York offices for Omni International Hotels and facilities for Lea Ronal in New York, California, England and Germany. Tim has been a guest speaker at Pratt Institute, Cornell University, City College, Bank Street College of Education, Centenary College, NY Institute of Technology, the Somerset Art Association and the Architectural Forum of the Hamptons. Tim served as President of the New York Council of the Society of American Registered Architects. Since 1975, Tim has been a member of the faculty at New York City College of Technology/CUNY. This is CUNY’s senior technical college. He has, and continues to, inspire students to understand the role of architect in a greater context that includes public service. Tim instituted a policy of service learning in the Department of Architectural Technology, which was shared throughout CUNY. He has helped many architecture students understand civic responsibility and appreciate their special roles as architects in the ongoing betterment of our city and the environment in which we live. 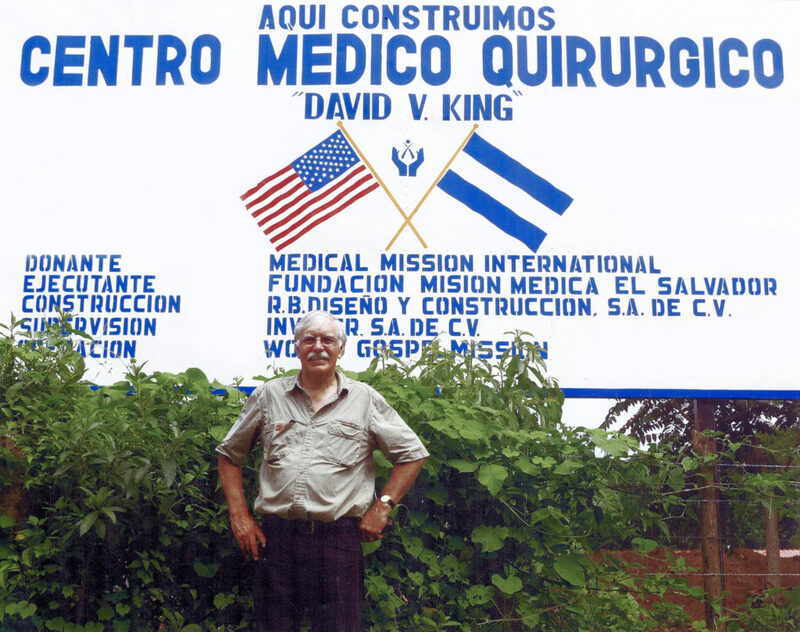 Tim has provided pro-bono design services to Medical Mission International, a group of doctors and surgeons working in El Salvador who are building a facility to house a surgical center, accompanying housing, a school, workshops and support facilities. Below is a sampling of work —all completed in collaboration with students at City Tech in the Department of Architectural Technology. Tim conducted studies for the Metro Tech Business Improvement District in Brooklyn, NY. Components of the plan for a several block area entailed renovation of storefronts, sidewalk improvements, graphics and historic restoration. Students developed presentations and exhibited their work at the corporate headquarters of Chase Manhattan Bank in Manhattan and at the Brooklyn Union Gas Headquarters, 1988-92. Prior to the actualization of the “new” Times Square, Tim’s students prepared a video illustrating proposals for the West 42nd Street redevelopment. This study, which also included models and drawings, was exhibited at the Port Authority of New York. Student work illustrated the need to preserve existing functions within the intensive new construction being planned, 1980-82. Working with the East Midtown Coalition, Tim’s students produced shadow studies and architectural models that resulted in the significant lowering of building heights for the proposed ten acre development site along the East River directly south of the United Nations.. 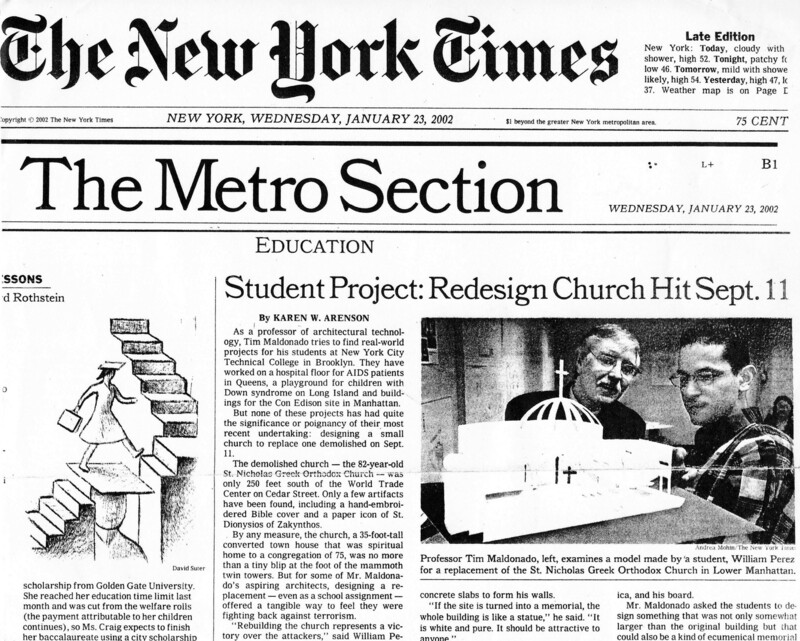 The huge scope of the project and the concessions obtained were documented in the New York Times, 2004-08. 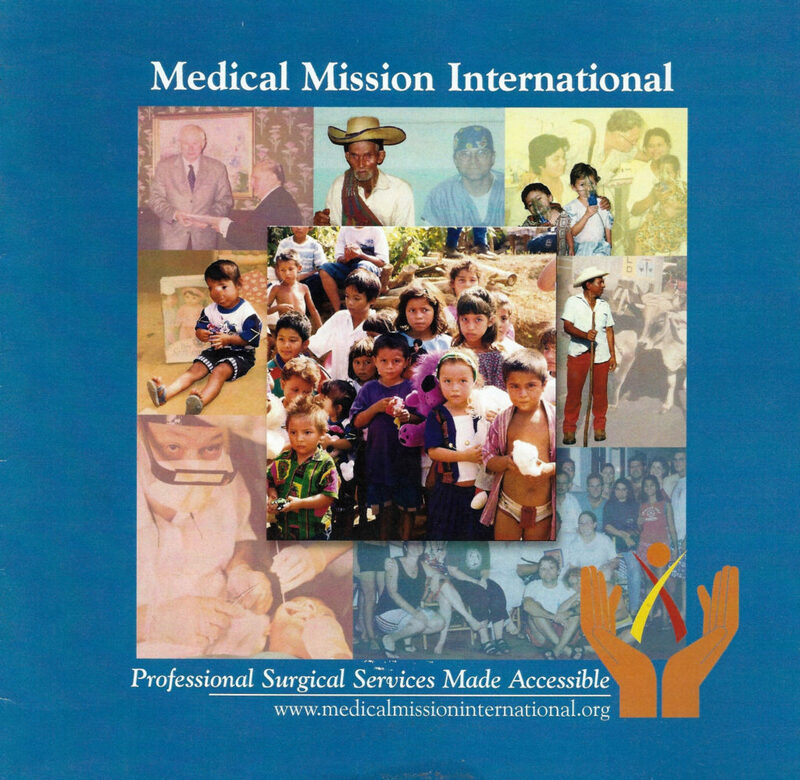 Students worked on the development of a master plan and hospital building for Medical Mission International. The project, located on a thirty acre site in rural El Salvador entailed a surgical center and clinic, housing for visiting doctors, an administration building, a school, workshop facilities and a chapel. Phase I, the clinic and surgical center, has already been completed and is being used by the local residents. 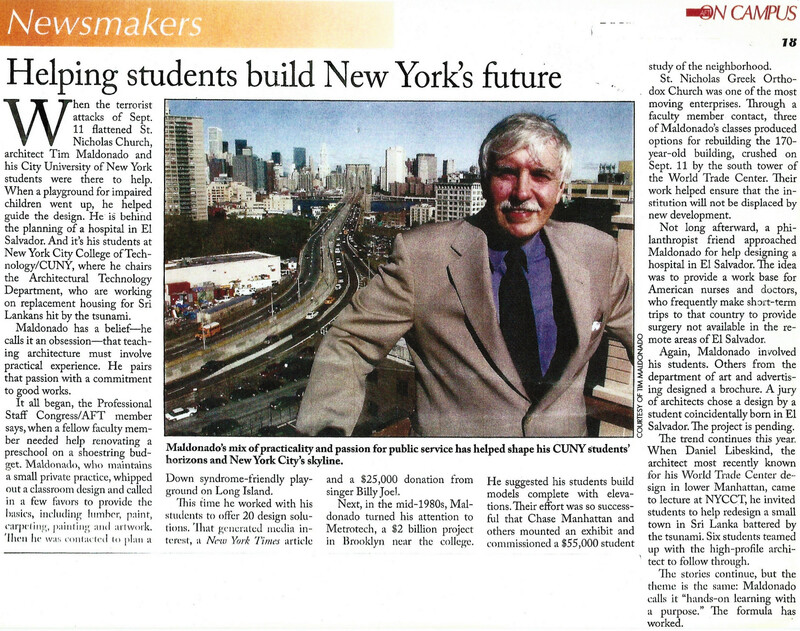 This project was showcased in a Channel 75 documentary (CUNY), “Study with the Best” in 2008. The Village of Greenwood Lake, led by its mayor, partnered with the college in order to turn a 4 acre parking lot at the water’s edge into a vibrant and useful public space. Students worked on solutions to this challenging problem and also developed a master plan for the town. 2008-09. Developed a master plan for the expansion of St. Catherine’s Academy in the Bronx. Models, renderings and animations were produced and presented at their fund-raising event last year. Two million dollars have been raised so far towards construction. Agustin (Tim) Maldonado received the CUAA Peter Cooper Public Service Award in 2017 and was inducted into The Cooper Union Hall of Fame the same year. Study with the Best, CUNY TV’s show about CUNY, in 2008. This entry was tagged Peter Cooper Public Service Awrd, Tim Maldonado. Bookmark the permalink.